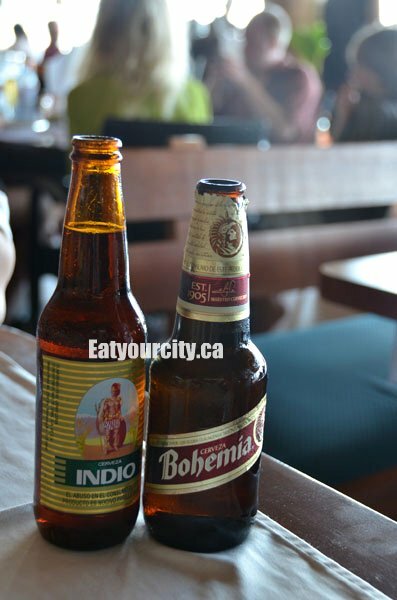 Eat Your City: The Blue Shrimp, Puerto Vallarta, Mexico - Awesome Portugese and tequila shrimp! The Blue Shrimp, Puerto Vallarta, Mexico - Awesome Portugese and tequila shrimp! and a mango and strawberry margarita. Tequila must be free because when the bartender brought over the margaritas, he just free poured tequila on top of whatever was already floating inside to his hearts content....these guys are definitely very generous with the alcohol, making for wicked strong drinks... Bottoms up!! According to the menu, this was a bacon wrapped shrimp stuffed with cheese. Something was lost in translation, but what came out was pure awesomeness. With "Chef's Creations", you choose the size of your shrimp, (regular or jumbo), then you choose the weight (1/4, 1/2, or a full kilogram) For reference, 1/4 kilo= 6 jumbo shrimp. Should have ordered a full kilo of these. 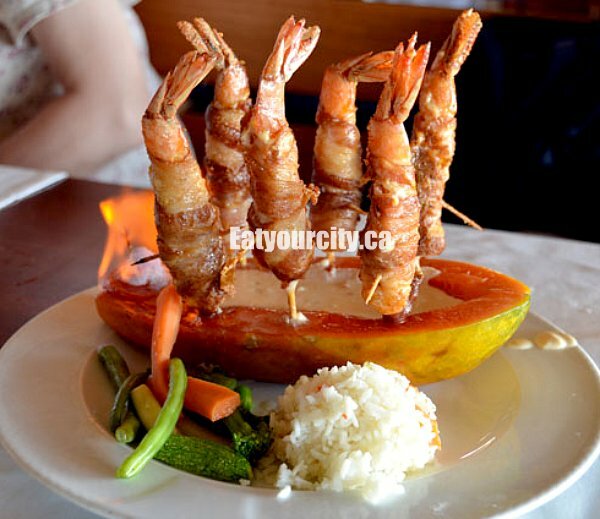 The 6 jumbo shrimp are wrapped with bacon, and deep fried to perfection (no tough old shrimp here!). They are skewered with toothpicks on the side and thru the shrimp - so it looked like a shrimp billy/night stick to aid in eating them without burning your fingers. As a nice touch, there was an open fire pot on the side so you can roasty toasty it a little more before you eat. The cheese dipping sauce inside a ripe papaya bowl (not inside the shrimp) was incredibly indulgently rich and paired well with the bacon wrapped shrimp. We could not get enough! The papaya is a garnish, but who can pass on a papaya that is begging to be eaten! We ate the perfectly ripened papaya as well... so delicious!!! All Chef's creations come with a side of rice and veggies. the rice tasted like it was cooked in broth, as it had hits of saltiness. Some of the rice was undercooked, so you had an interesting mouthfeel - it seemed to be this way at all the places we ate at in Mexico. Mmmm. Bacon wrapped jumbo shrimp and cheese. Bacon+shrimp+cheese = I need another order.. or 5! 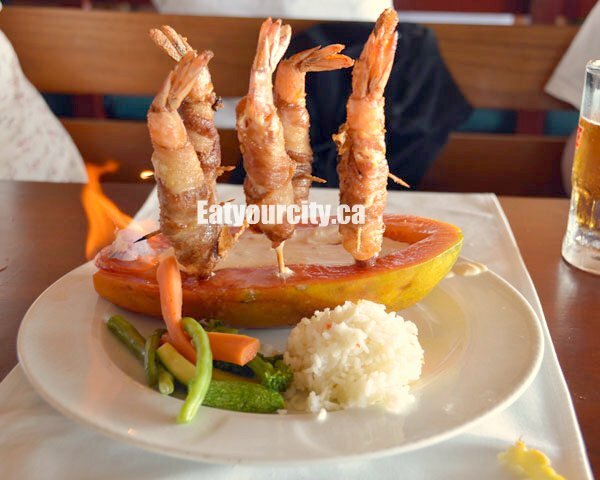 The description in the menu was a little deceiving, as we were expecting flambeed shrimp with tequila. Instead to our surprise it comes out with sliced peppers and onions and a very rich creamy cheesy seafood flavoured sauce. The sauce was soooo good!! We mixed our sides of rice from other dishes into it to soak up the rest of the tequila creamy goodness. It tasted even better with rice! 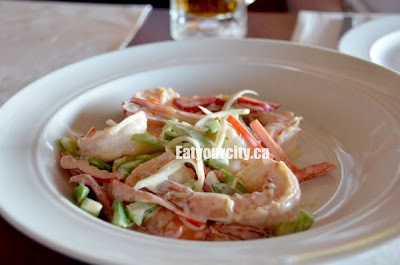 Head here for some wicked huge succulent shrimp cooked anyway you like... make sure you get the full kilo! And if you're planning to drink, be prepared for a lota boooooze!